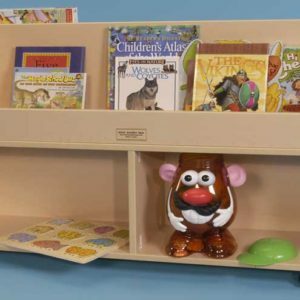 Made of 3/4″ sturdy melamine, available in colors of natural, blue, red and yellow. 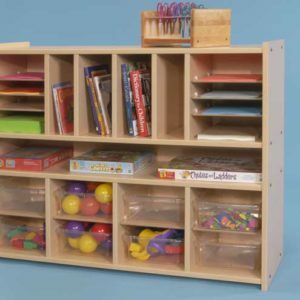 Storage locker can be used by teachers for storage of personal items such as puzzles, games, small school supplies, art materials, binders, mathematical / scientific manipulatives. Can also be used for of small musical instruments and sports equipment. Keep everything locked up with a personal key to the unit. 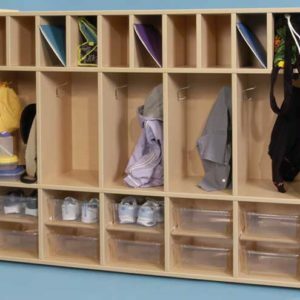 Locker comes with bins shown ( will color match to the unit ). Comes knockdown with easy to assemble instructions.